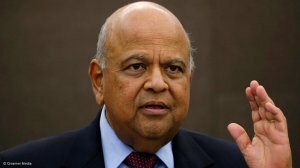 Public Enterprises Minister Pravin Gordhan has told the Zondo inquiry into State capture he believes that the push-back by the perpetrators of State capture was real and he was personally feeling it in the form of an investigation by the Public Protector along the same lines as the trumped up political charges brought against him in 2016. "The complaint was lodged on 18 November 2016 by Mr Lebogang Hoveka, who was then a speech writer in the presidency," he said in a written statement to the inquiry. "Suffice it to say that at least two of these projects share similarities with respect to their size in monetary value and the level of personal interest showed by former president Zuma in them," he added. The projects were the procurement of more nuclear power capacity, which Gordhan said Zuma patently wanted to do buy from Russia, and a deal for PetroSA to buy the shareholding of Malaysia's Petronas in Engen for R18.68-billion. With regard to the latter, Gordhan said he became suspicious when National Treasury became aware that the true value of the shareholding was some R6-billion less. "This raised red flags to me as to why there was a possible difference of R6-billion in possible valuations of the Engen stake, and who may benefit from the difference." He said he hoped that the Zondo commission would be able to further investigate this deal, which fell through after PetroSA failed to fulfill the financing conditions.